Farmers are in trouble, they say. Because things are really really bad. Farmers have seen prices drop big time, they say. Too much planting and too much food, in general, means the supply is way higher than demand. Prices have had to fall. They can’t make any money! In a topsy turvy world, where a few years ago farmers were distressed because of a failed crop, they now suffer because there was too good a crop. Look at food inflation. It’s fallen to sub-zero levels, which means prices are lower than a year earlier. But that doesn’t really mean there is deflation! 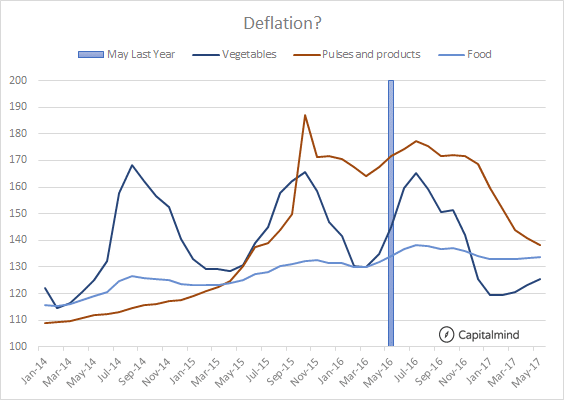 The biggest impact this time, on low inflation, was vegetables (-13%) and Pulses (-19%). You would think that is a disaster. But in the inflation data, let me say this unequivocally: This is not deflation. Price trends are cyclical and you can see how food inflation also is still trending up. We have marked May 2016 – the one-year-ago mark – for convenience. None of this looks like deflation. Pulses are still way higher priced than they were in Jan 2014 (around 25% higher, which is still 7% inflation per year). Vegetables in fact bottomed out recently and are increasing in price slowly, and you can see that much about this is cyclical. And the rest of the stuff in food: Prices Are Going UP! 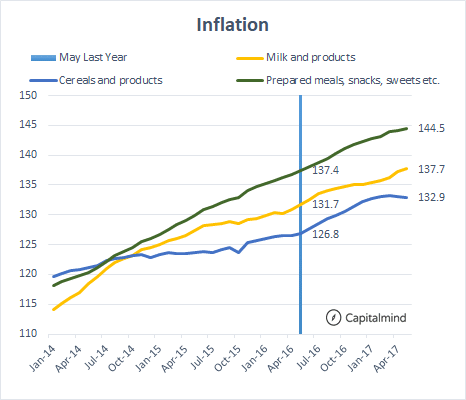 While you can’t really figure this out – prices of cereals, Milk and snacks are showing a straight up-trend. The inflation may not be heavy – around 5% or so – but there’s no downward break. And there’s no deflation elsewhere too. From Sugar to Meat to Spices the uptrend is marginal but intact. There isnothing major here to declare “deflation” or that prices are so low they demand attention. Waiving all loans of all farmers is fairly silly. Obviously people who grew cereals didn’t see the same damage as those that hit pulses. Meat prices are the highest they’ve been in the last three years. Milk prices are up too, steadily. So why forgive everyone’s loans just because a few people have had an issue (and are rioting)? If we also address cold storage then farmers can store some food (pulses for sure, but probably some veggies) so that all the supply doesn’t hit the market at the same time. Whatever the case, the problem of the farmers is not that prices are low. It’s that they grow the wrong thing, they don’t know how to store the thing they grow so that over/undersupply doesn’t happen, and they cannot easily improve their productivity due to archaic rules. There are other issues, like trader cabals that push auction prices lower, or their inability to sell to different markets too. We have to address these problems rather than just waive off loans. But the answer to every farmer agitation seems to be that loans will be waived off. Prices too high: waiver. Prices too low: waiver. No one gets this kind of mollycoddling in regular life, even the corporates who have defaulted; and this introduces the same problem as corporates have – moral hazard. Meaning, don’t pay up even if you can, we’ll somehow rescue you. We have to stop doing that, for both big corporate houses and for farmers. 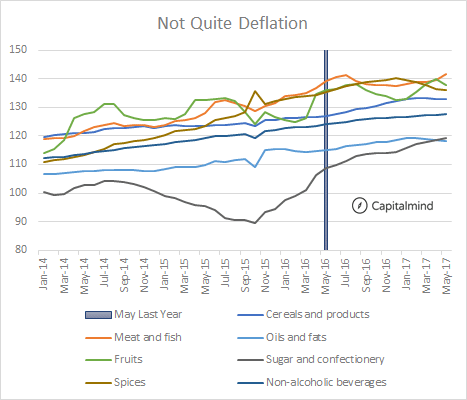 Unfortunately, no one cares about the simple fact that the data reveals: this price fall is not extraordinary, and there are lots of food items where prices have not fallen. Instead of blindly planting stuff that has currently risen in price, it’s better to understand cycles and plant accordingly. Right now, it may be better to plant pulses for next year, or plan for vegetable produce, as prices are at the bottom of the cycle. We hope that in later years, we have better district level metrics to plan in this manner.